When we make these little Bacon Planks I either have to make a double batch or hide the batch until ready to serve. These little Planks seem to just disappear faster than I can make them. These crunchy little tidbits are a great savory and sweet treat that are easy to make and very versatile. Hope you enjoy our Bacon Planks as much as we do. Place 1/2 teaspoon of either Parmesan Cheese or 1/2 teaspoon dark brown sugar on top of each cracker. With one half of a slice of thin sliced bacon wrap the entire cracker with the cheese or sugar. 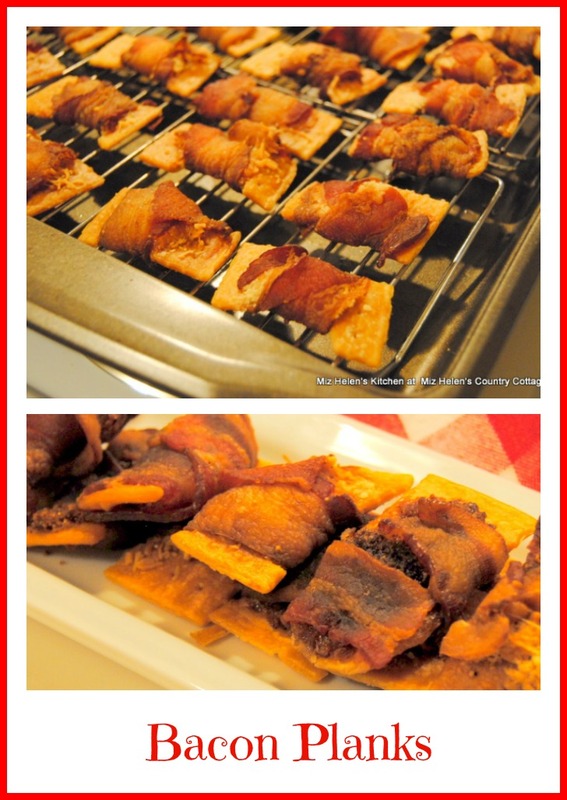 Place the bacon wrapped cracker on a wire rack sitting in a baking dish. These Planks can be frozen and reheated before serving. Thanks so much for stopping by to spend some time in the kitchen with us today, it is always more fun when cooking with a friend. Hope you have a great week and come back to see us real soon! I haven't made these in forever, a timeless classic for sure! We love these and now I am teaching my Granddaughters to make them. Thanks for stopping by Jenna, it is always good to see you! Oh these sound so good. I'd have some for breakfast today, but I'm already at work and no ingredients here. I'd pick the brown sugar version. Salty/sweet. You sound like me Linda, I have grabbed one for breakfast before, YUM! Thanks so much for stopping by, it is good to see you at the cottage always! I can see why they disappear so quickly! What a fun snack. Thanks so much Carlee, it is a fun snack and yummy! Thanks for stopping by it is great to see you! Oh, those look delightful! I bet a Manhattan would go with nicely...Pinning them right now! You are so right, a nice little plate of these and you are good to go. Thanks so much for the pin and stopping by the cottage, always good to see you! You had me at bacon....wrap a piece of cardboard in bacon and I'll eat it, lol! You and me both Jas, if its bacon then it is good! Thanks so much for stopping by, it is good to see you here at the cottage! I've never made these, Miz Helen, but I must make them soon. My youngest son smoked his own bacon and gave me several packages and this would be a great way to use some. Oh my goodness! This recipe makes me giggle! I've never heard of such a thing...with crackers. But can imagine how mouth-watering it is. So glad I saw this. Pinning! These look like a treat that my guys would LOVE. :) Yum. I've tried these and they are wonderful! Thank you for the wonderful reminder! A bacon recipe - hold me back! We LOVE bacon at our house (except the dog). Can't wait to try this. Thanks for sharing at Over the Moon and we look forward to seeing you again next week. You had me at bacon! I need to make up a tray of these for myself! Thanks for linking up with Merry Monday this week. Sounds great! Thanks for sharing on the What's for Dinner link up! Thank you for sharing this delicious recipe at the #RecipeSharingParty! I hope to see you next week. Pinned and Yummed. Please visit #OverTheMoon on Sunday, #WonderfulWednesday or #ThursdayFavoriteThings for more sharing fun! No wonder your bacon planks disappear quickly, Miz Helen. They look so tasty! What wonderful finger food - perfect for any occasion. Sharing on the Hearth and Soul Facebook page later today. Hope you are having a lovely week!